Keep Our Troops At The Front Firing! Let’s state the working assumptions of the system before getting into how to build upon it. 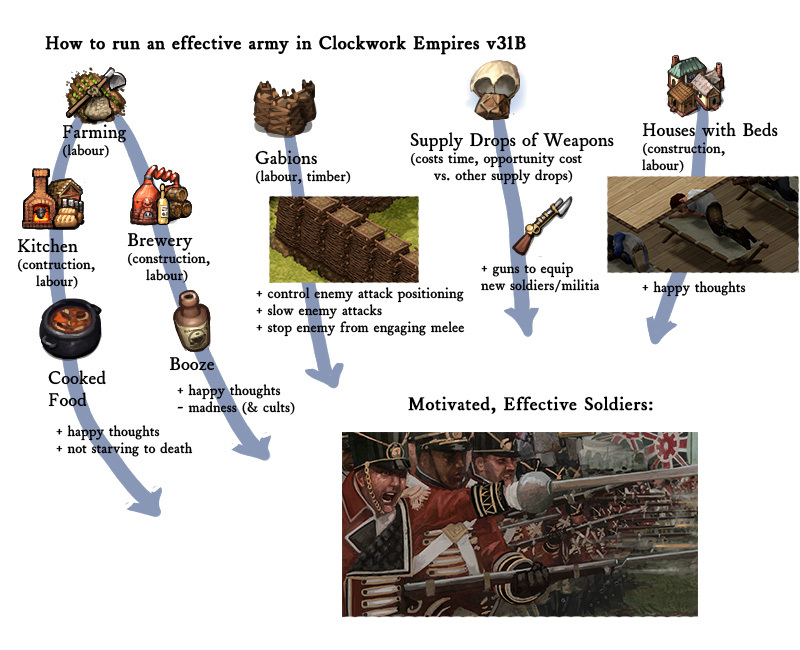 We have combat in Clockwork Empires. A player’s soldiers combat effectiveness is determined pretty much entirely by your soldiers morale and their ability to output damage. Damage output is based on weapons (which don’t have a lot of variation right now and aren’t controlled by the player anyway) and on positioning/density of troops vs. enemies (which is determined mostly by procedural circumstances, though the player has some control over terrain via gabion construction and positioning via use of rally points). Morale is determined by how upset people are and can be controlled by not getting people killed, having good cooked food available, booze, having nice houses with beds to sleep in, and letting people make friends (idle time). Although if people are the least bit upset, they’ll get recruited into a cult rather than just making friends, so that last bit can be troublesome. Let’s make a visualization of this because I like pictures. Right, so that’s pretty good. Ties lots of game systems together. But wait, we could make this more interesting! There is, I hear, more to life than growing cabbage in your dirt-fort and swilling some beer before sleeping in a miserable cot. Plus most of this is automatic once the player sets up the farms and buildings. We want the player to be able to make some more interesting decisions as well as provoke them to move higher into the advanced buildings like, oh, how about the the Refinery/Metalworks/Arsenal line? That’d be nice. It wouldn’t hurt to introduce the possibilities of harrowing peril while we’re at it, either. Now how do we do that? The plan is to tie “teching up your industry” to combat effectiveness, provide interesting opportunities to allocate limited resources, provide interesting situations good & bad for your soldiers to get involved in, and create the need for more combat effectiveness so we have a nice feedback loop going on. Firing a (single-shot) gun costs one bullet. You can’t fire a gun without bullets. Soldiers can carry 20 bullets. Crate of Ammo (an existing commodity object) hold 100 bullets. When a crate holds zero bullets, it should disappear. When soldiers have fewer than their maximum bullets, they should want to retrieve bullets from a crate. When soldiers are running low on ammo, they should feel less compelled to stay in a fight. When a soldier dies, they should drop their bullets. From the player’s perspective, creating a Crate of Ammunition at an Arsenal costs Barrel of Gunpowder and Brass Ingots. Easy! Wait – how do you make those? 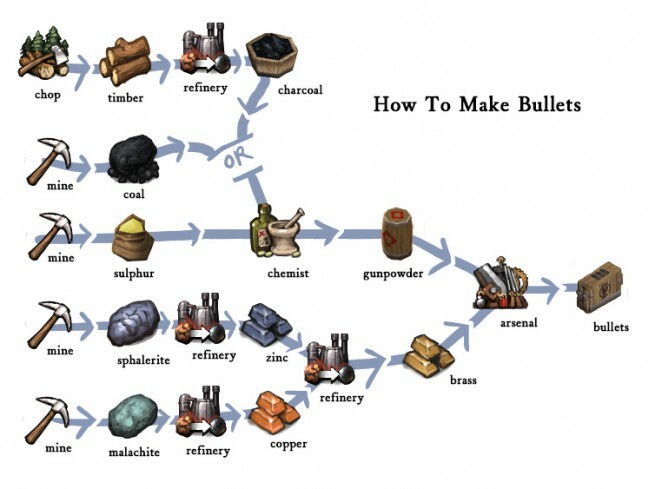 Barrel of Gunpowder requires Sulphur and Coal (or Charcoal) to be combined at a Chemists Workshop. Sulphur must be mined. Coal must be mined from the ground. Charcoal can be produced in a Charcoal Kiln at a Refinery from Timber from chopped down Trees. Brass Ingots are made from Copper Ingots and Zinc Ingots combined in a Refinery. Copper Ingots are smelted at a Refinery from Malachite (an ore of copper) mined from Malachite Nodes. Zinc Ingots are smelted at a Refinery from Sphalerite (an ore of zinc) mined from Sphalerite Nodes. Still with me? I think it’s time for a picture. Ammunition introduces another indirect element to combat effectiveness (vs. the direct element of “needing bullets to shoot at all”): simply have bullets remaining weight the utility of a soldier decide to fight vs. flee. From here, we get poorly-equipped soldiers who are running low on ammo being more likely to run from battle (unless, say, they possess the trait “Foolishly Brave” in which case they may fight it out with bayonet). This ties ammo back into the character system, and it rewards players who have effectively supplied their soldiers. Excellent. Oh yes, landmines: this was mentioned it last week. Their effect is essentially to make placement of gabions aka manipulation of enemy movement really interesting. Landmines are a bit expensive – probably not even a good deal right now, which’ll require gameplay balancing – so you want to put them exactly where you think they’ll do some good such as between gaps in your gabion wall. We’re implementing the plans laid long ago. In creating these systems, the implementation itself suggests new mechanics that arise from the interacting mechanics. It’s really neat, and it’ll just get more interesting as we add new pieces to the mix. Of course, starting with a stock of bullets and trying to save them, hoping against hope for supply drops, maybe making simple melee weapons to use when the bullets run low and the fishmen are burbling in the night—that IS interesting. I think some lower-tech alternatives might smooth the curve out a bit. 2. Trade of some kind, so you can ‘cheat’ the tech tree provided your colony has /some/ speciality. I love your charts too! I even made some of my own. Now all I need to fulfill my life is some sort of CE information that can be presented in the form of a Venn diagram. Airships, presumably. And they’ve been in for quite some time now actually as an event that allows the player to select whether they want food, weapons, or building materials. Will ammunition in crates or dropped be able to explode if it, say, catches fire? And for that matter, is there fire? Not currently attached to ammo crates, but the very start of object damage is in the game and can trigger explosions. Landmines, for example, can detonate adjacent landmines if they’re placed too close together. Oh, it’s inside everyone in the office as we speak. Oh man, if Clockwork Empires’ development is delayed by Ebola, I am going to be so pissed. Sorry to ask a question that while related does diverge from the topic a bit, but, what are the chances of encountering other countries soldiers, explorers and colonies? I mean, if there is steam punk Britain, will there be steam punk France? There will be other Great Powers out there. More on all that in future updates! Dude, le Republique Mecanique! Sometimes I wonder, do you even care? The ammunition system as laid out is satisfying, even if it is missing a few essentials in the manufacturing procedure. Your gunpowder recipe is missing an all-important oxider (saltpetre), but I’ll just assume the Arsenal has a nitre bed under the building where the colonists’ nightsoil is collected and processed into what they need. Your ammunition has brass for the casings and gunpowder to fill them, but no bullets to be casted? Or is the brass also what the bullets are made from, seeing how Clockwork is a lead-free environment? What I want to see is more powerful weapons becoming available, perhaps even giving us the chance to build our colony’s war industry up to a point where we can challenge the Empire, strike for independence, and battle it out in the skies with our former imperial masters? That would be some wicked end-game to look forward to. We did painfully accurate crafting for Dredmor and it was actually a terrible idea due to inventory space and item shuffling effort overhead. This is not dissimilar to the Dwarf Fortress phenomenon of soap being more work to produce than most metals! 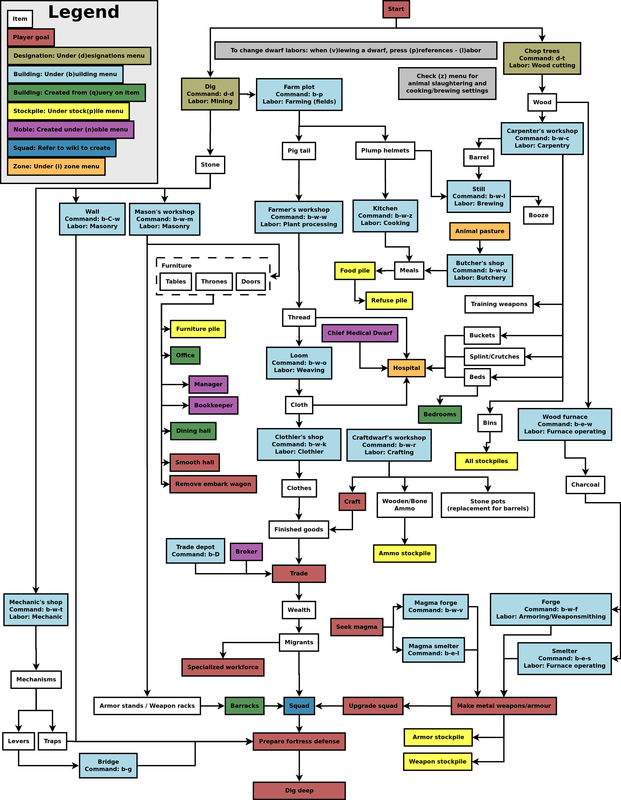 Some amount of handwaving here is necessary – and if a system is found anemic, there are easy opportunities for increasing complexity available which I am entirely eager to implement. … Likewise with bullets, which I *am* fully a nerd about; This is a period with possibly fascinating transitions from powder & shot to cartridge w/ separate ball then minie ball, to metal cartridges advancing from rimfire to center fire, to say nothing of wheel-lock to flintlock to percussion cap to whatever, and then clips to even magazines at the top level of tech … … but if we tracked 8 different types of ammo it’d drive everyone (else) totally crazy. So we have to make allowances. I found myself wondering why the Refinery and Metalworks are different buildings. … I wonder that myself sometimes. Bullets and landmines, argh, that’s awesome, love to see how smb’s blowing up. 1. What about grenades, machinegun turrets and artillery turrets? 2. Why you – Gaslamp games guys – are so awesome? 1. We can talk about those when we have something to show for it. 2. Something in the water? 1. Can’t wait, but I have to. 2. You guys are awesome. WHY!? Gotta say, these last few updates are worrying me a little bit. I know that it’s probably just because you’re focusing on fixing combat right now, but I’m here for the builder-game industrial logistics. Clothing! Health-care! Visiting naturalists and poets! Unreasonable production demands from Parliament! Yeah, that’s what I was figuring. I just got worried because combat logistics hijacked Gnomoria for quite a while. ho installato la patch 31C ed ho avuto problemi con i militari che combattono poco,poi alcuni errori segnalati sul cimitero e quando ho posizionato le mine,poi ritengo migliore il primo sistema di costruzione edifici,miglioramenti sul cibo,attendo al piu’ presto aggiornamento,ciao e good job! Oh, DF. Though I love you, I’ll never understand you. If you don’t mind I have another question to blurt out in your general direction. Will there be a chance of exploring and finding the spooky remains of a destroyed colony? I mean, this is a probably quiet a bit of work, but anyway, maybe? Oh, I don’t know, that sounds pretty cool to me.